Please have a seat & enjoy the unique venue, says this cushion cover. At least, that is the text of the light embroidery on the light coloured back. 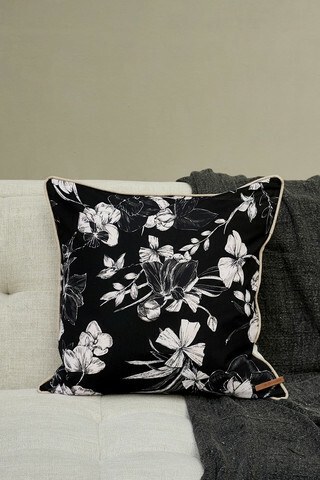 The front shows a rich floral pattern in black, white and grey. A spacious cushion cover for an inner cushion of 50 x 50 centimetres. Made of a textile mix, washable by hand.